"A writer unleashes his emotions through clever words." What we do here at Earnesty  Community is make sure you undiscovered and discovered writers out there get the recognition you need for your creativity. Writing is a big deal and we know each and every writer once in their writing life would want someone to recognise them for their work to give them the extra push they need to believe in their abilities to write the next Harry potter series or Hunger games trilogy. 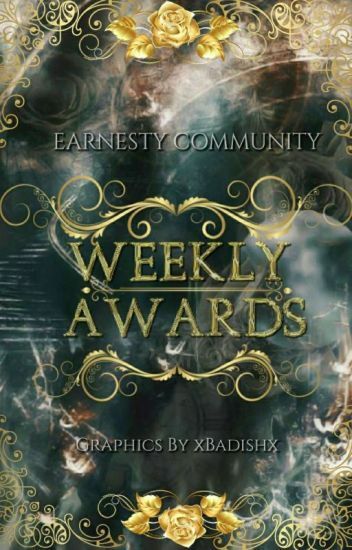 That is why this weekly awards is here. Head on inside and find out more? Contest 7: Run! Run! Run! It has been a year since we started this competition, and we are glad to announce that the 3rd edition is here, alongside with many wonderful prizes, games and challenges! We hope to see both familiar faces and new ones, so open the book, read the rules, sign the form and be awesome! Welcome to another addition of THE GOLDEN AWARDS for the 2019 season! We here at THE GOLDEN AWARDS aim to help great authors receive the recognition their works deserve! The undiscovered become discovered with the exposure from this awards! COME ONE ...COME ALL...JOIN TODAY...YOUR STORY IS WAITING TO BE DISCOVERED! Basically, here we will showcase the books that will be reviewed by us. The community is here to help the writers review and showcase their work. Also, for the readers to get easy access to the best works on Wattpad. PS: If you would like your work reviewed here please make sure to read the second chapter and follow the instructions. "Open your heart and unleash the poet within you." These awards are one of best places on Wattpad for a poet to be recognised. Do you think your words weave magic and hold the breath of the readers? Take part in these awards and stand a chance to win amazing prizes. *A Panel of Judges- NO VOTES! Want to know more? Read On! Hey !! Welcome to The Adventure Awards !! Are you an undiscovered writer? Do you want your books to get discovered? Huh? Do you love giving feedbacks on books or do you love to judge books? Well then join us in The Adventure Awards by becoming a judge or a participant. Are you struggling to get honest feedback and reads for your book? Are you tired of different awards suddenly closed or became silent? If you are, then you've come to the right place! Here at Concinnity Circle, we aim to provide the maximum insight for undiscovered writers and try our best to help them. We present to you: Writer's Circle Awards 2019 - a place where you can get an unbiased review, make new friends and meet other talented writers! In Writer's Circle Awards 2019, we not only have friendly neighbourhood spider -- sorry -- hosts, we also have an experienced and high-standard judging panel. We try to offer you the best in Concinnity Circle, and we hope not to disappoint you with the awards! What are you waiting for, dear writer? Come and apply; join the fun in the Circle!